Second Thursday, you say? Well, you know what that means! Yes, it’s time once again for the Monthly Silhouette Creator’s Challenge! Once a month, a few of my bloggy friends and I make a super awesome project using our Silhouette machines. For previous challenges, I have made a custom Harry Potter t-shirt, some fun British phone booth art, a pretty Coldplay lyric tote bag, and a handy crochet hook storage box, and a little beach finds treasure bag. This month we had a theme, which was cloth. So I decided to decorate a little tea towel. 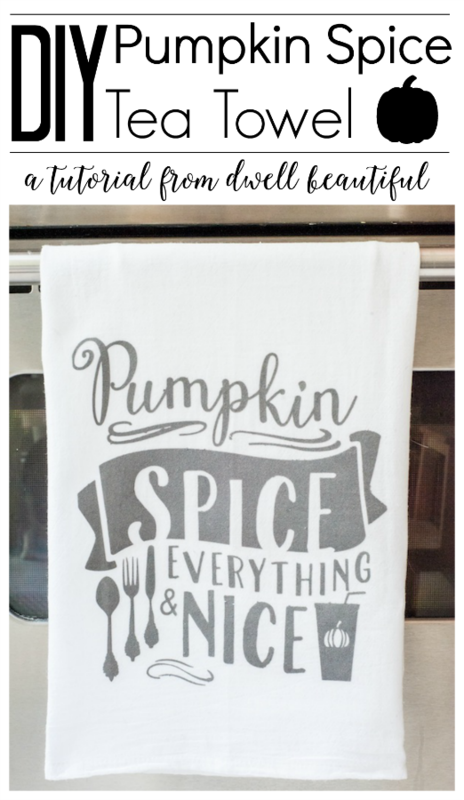 And since it’s fall, I figured it would be best to theme my tea towel around everyone’s favorite fall flavor – pumpkin spice! Check out the tutorial for my tea towel below and then stick around for everyone else’s awesome projects at the end of this post! I don’t know about you but I LOVE pumpkin spice. Yes, I know liking pumpkin spice is supposed to make me a “basic white girl” but I honestly can’t help loving it! It just evokes the beginning of fall for me; it gets me ready for sweaters and boots and scarves and nights spent by the fire. Pumpkin spice and everything nice. So this little tea towel is an ode to the flavor we all know and love. Follow along for the instructions! In your Silhouette Design Studio software, pull up this Pumpkin Spice and everything nice design and size it to fit your tea towel by dragging the edges to your desired width and height. When working with heat transfer material, you always have to flip your design so that it will face the correct way when you iron it on your tea towel. To do this, go to the ‘Object’ menu > Mirror > Flip Horizontally. Send it to your Silhouette by selecting “flocked heat transfer material” as the material type and set your blade to 4. Once your Silhouette has cut your design onto the heat transfer material, weed out the excess fabric until you are left with your full design. Lay onto your tea towel in your desired position. Think about where you will be folding the towel to display it and make sure your design fits within those folds. For me, I put my design near the bottom of the tea towel and smack dab in the middle so that it’s visible when I fold it. Iron away! Set your iron to it’s hottest setting, and then place a scrap piece of fabric or a washcloth over your design. Iron back and forth over the top of it to ensure that it fuses to your tea towel. Once you’re sure it’s adhered to the towel, peel back the plastic cover to reveal your finished design! It’s that easy! This project took me all of 15 minutes and now I have an awesome and adorable pumpkin spice tea towel as a piece of kitchen fall decor. Check it out! I’m a tactile person by nature, so I love the flocked fuzzy feeling of the heat transfer material. The teal towel can go in the wash along with the rest of your hand towels – the heat transfer material will stay on just fine! This pumpkin spice towel would also look great with a rusty orange design, to make it really pop for fall. This is so cute!! I love how easy it is to make these one of a kind towels. Super cute! I really love it! The grey is perfection! These are so cute Erica! I love pumpkin spice even if that makes me cliche! Thank you for joining in the fun! pinning! I can’t resist Pumpkin spice either! Who cares what everyone else thinks 😉 Thanks so much for organizing again! So many great projects! Love your tea towel and anything pumpkin spice 🙂 And that adorable little shelf above your stove that you have your oils on, can you tell me where it is from? I need one! Thanks so much, Kati! Pumpkin spice is the best 🙂 And as for the shelf, it was there when we bought the house and it looks like it’s a built-in part of the stove? It might be available for sale as a separate piece – the brand is Frigidaire Gallery, so perhaps you’d be able to find it somewhere! I love this tea towel! I’ve tried doing iron transfers before but the transfer paper always shows on my tea towel! Do you use a special paper or have any techniques so that this doesn’t show up?